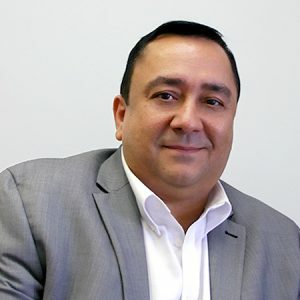 Rafael Martinez is a senior-level executive with over 30 years experience in corporate environments; with a high aptitude for business development as well as executive leadership and management experience. His core strengths lie in his business acumen to maximize client satisfaction through needs analysis along with enhancing company profitability through account penetration. Building territories and market share from the ground up! MENTOR: My first boss – He taught me everything I needed to know about running a company from the ground up. I owe the success of my business and career to him. HOBBIES: Spending quality time with my family and friends. I am definitely a family oriented individual. Those who know me also call me a foodie for my passion in exquisite food. WHAT PEOPLE WOULD BE SURPRISED TO LEARN ABOUT YOU: That I started working in our family business at 14 and managing a team of people at 16. I also believe people would be surprised to learn that I am an admirer of art and have written a few articles published on art and antiques magazine. SECRET FEAR: Failure – I keep telling myself on a regular basis that failure is not an option. I focus on a solution to every problem in life. MOST PROUD OF: Personally, my family is what I take the most pride in. Professionally, I am proud to have personally been involved in the growth and success of every business that I have been associated with. PERSONAL HERO: My father. He taught me values and morals that are the foundation for my life on a daily basis.